I enjoy looking for and finding old tools that can be saved from the scrap heap, restored and put back to work. For some years now I've been to boot sales, markets, junk shops etc, collecting what a lot of people would call 'useless rusty junk.' If you have an enquiring mind there's nothing better than taking something to pieces to see how it was made and designed. This may even give you some ideas that will be of use one day. 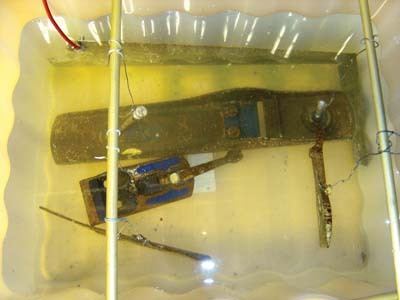 When I discovered this method of de-rusting tools through electrolysis, it meant I could clean and free off the more seized-up items and often expose the maker's name or patent details. 1. If you have several items to clean, it would be best to select a container to hold the largest item and a few of the smaller things. To show how simple this process is, I went to Homebase to check out what they stocked, and bought a plastic storage container - these cost under Â£3 and you may well have one already that will do. 2. Second, some soda crystals are required from the household section of your nearest supermarket or hardware shop. 3. 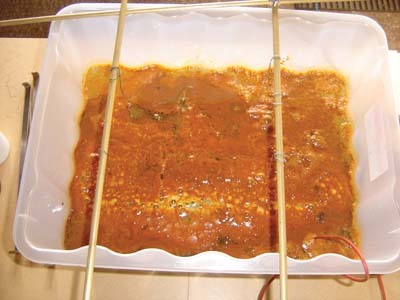 Third, a piece of steel sheet is needed to act as a sacrificial anode. I racked my brain thinking what I could use and then suddenly it came to me - an old handsaw blade was the answer. Break off the plastic handle and cut the blade to fit the longer side of the container. Under the handle there are a few holes - use one of these to bolt the positive wire connection to. 4. Fourth, some bars to hang the items from with simple thin binding wire, or wire stripped out of a piece of cable. 5. Finally, a 12 volt car battery charger - the average one delivers about 4 amps of DC current, quite sufficient for this purpose. Alternatively, a fully charged, freestanding car battery will work just as well. Connect a short length of cable to the steel plate with a nut and bolt, and stand this to one side of the box in such a way that it will not fall over and touch the item to be cleaned - this wire needs to be connected to the positive lead of the battery or charger. I put about two gallons of water in the box, together with a cupful of washing soda crystals and stirred it in well. The soda is so dilute it will not matter if you put your hand in the fluid, but do turn the charger off first or disconnect the battery. I found some bars that reach across the box to hang the items on, using brass strips I happened to have, but they could have been any sort of metal. It's important to get a good electrical connection on the items, so clean a small section back to bare metal where the suspension wire is to be attached. 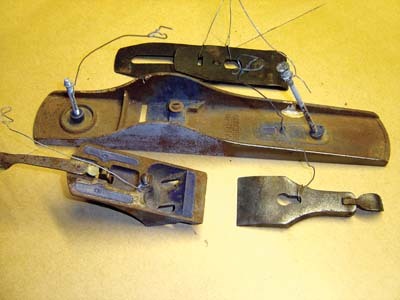 I used a very rusty old No.5 plane to clean, took it to pieces and hung the body from the two handle bolts on wires and the other parts on single wires. I placed them all under water so they were covered and not touching the mild steel plate. The negative clip of the charger is connected to the brass rod; I turned on the battery charger and within a few moments, the water started to swirl around and bubbles appeared - a sign that all is well. 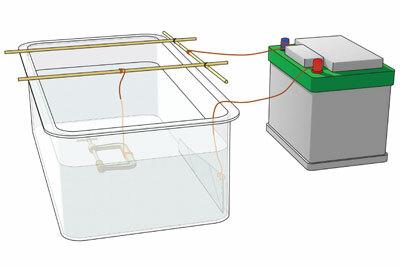 A noticeable reduction in activity around the submerged components will indicate the car battery needs recharging if you are using this method. I left the plane for 24 hours before turning off and removing it. The water was now covered in brown foam, which is evidence of the rust removal. The plane was rinsed in water and left to dry, then given a light going over with a rotary 6in wire brush. A plane is not the easiest thing to clean because there are so many awkward corners to get into, but with a hand wire brush and a scraper, it can be done. 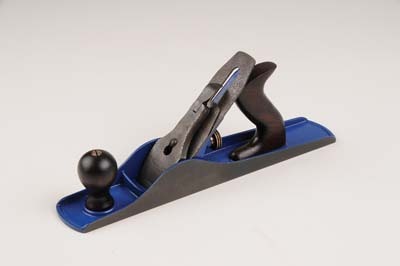 Believe it or not, the plane had never been used and the sole is unmarked. The blade was the most rusty but the back iron had protected the back of the blade and it's good enough to sharpen and use again. The plane can now be finished off by painting with an aerosol and assembling into a useful tool. Whatever you put on tools to stop them from rusting has to be repeated from time to time, or they need to be kept in a warm atmosphere away from moisture. 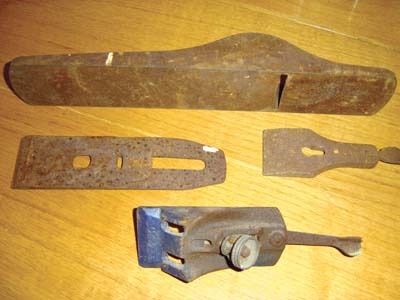 My collection of early Stanley planes is kept in purpose-made wooden drawers and seem to be fine but as they are used a fair amount, I can see if there's any rust appearing. There are a number of oils for sale that claim to preserve metal tools and I suggest trying one of these products if you have a damp workshop or sweaty hands. 3-in-1 oil is useful but even that doesn't last long, or wax can be used on tools that are in regular use and are left lying around on the bench, e.g. squares, chisels and screwdrivers. In the end it depends on how fussy you are - we live in the age of the disposable saw and cheap tools so why do we bother - because we love our tools! Finding the best wire brush for rust removal is not easy. I looked on the web to find that there is such a big selection that I was soon confused. 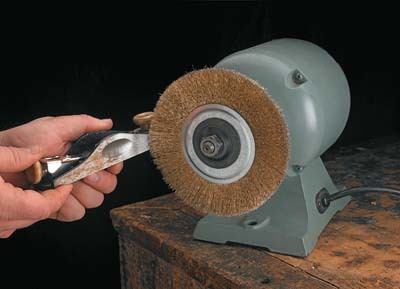 The wire brush I ended up buying is 150mm in diameter with 0.30 gauge wires and is the most common brush dealers seem to sell. 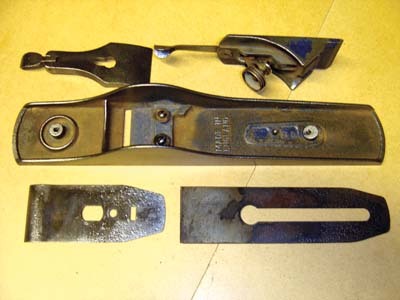 Generally it removes the rust residue, which is left on tools after they have been in the de-rusting tank. By coincidence Derek sent a rotary wire brush from Lee Valley to review for F&C. The diameter is the same but the crimped wires are much finer, in fact exactly half as thick at 0.15 gauge. This brush removes the residue just as well, but because the wires are thinner they are also more flexible. Getting into corners and difficult spots is made much easier. The final finish has also improved, leaving more of a polished effect to the metal. I always wear a full face mask when using wire brushes because they can shed their wire bristles without warning. However, so far I have not noticed any loss of them on this new brush. My conclusion is, look for a fine wire brush like these and I think you will be pleased with the results. You may think it's not worth going to all this trouble for a bit of old rust but I can guarantee it is. The pleasure it will give each time you restore a tool and make it work again is so satisfying. Other people ask me to clean things as diverse as an engine block to a small lathe and recently I cleaned a gadget that had lain by a railway track for years and got working an apparently impossible screw thread and sliding adjustment section. This method is economical, ecologically sound and so easy to set up - why not have a go? I was told that salt works just as well as soda and while I had the chance to try this, I emptied and rinsed the plastic box and replaced the water. Dishwasher salt was the first thing I thought of, so I added a cup full of this to the water. I have to say that this was just as good as soda and I cleaned three tools in just the same way as previously. The result was so good that I will be using the dishwasher salt in future!